As a rule of thumb, we avoid sugar substitutes is our house, in particular Sucralose (Splenda). We're not 100% organic eaters or anything, but I've -never- liked Sucralose. 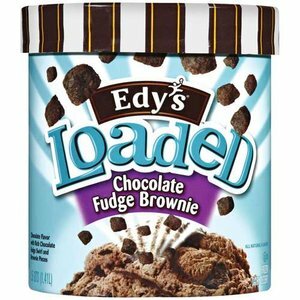 Edy's Loaded actually uses Sorbitol, a sugar alcohol, and technically it's not artificial ...it just happens to be a laxative if you eat to much. Ok, where in the Sam Hill am I going with this? Back to the beginning. We were at a birthday bash a few weeks ago, and being non drinkers, we did not partake in the adult beverages to help cool us down. No worries, my buddy planned ahead and stocked up the freezer with some tasty Edy's Loaded ice cream. I was more than happy to crack open a fresh container of Chocolate Fudge Brownie while my wife dug into the Cookies N' Cream. Mmmm, the fresh ice cream hit the spot on a warm summer night. Loaded has visited our freezer before and it is always tasty (not 100% sure I've tried them all). The only real downside is that the ingredient list is kind of extensive, not that the double churn flavors aren't the same way. So, if you need a tasty treat and you don't mind all the 'extra' ingredients, pick up a container of Loaded. You call the loaded "ice cream" but its technically a "dairy dessert" if you look at the container. This is true, but when I posted this review last summer, I wasn't yet pointing out which was which. To be honest, I'm disappointed (maybe just frightened) that they are taking so many of their flavors in this direction.